1 If you studied a map of Canada from before 1999, you might wonder how another territory could be added to Confederation. The land forming Nunavut (Our Land) was not new, but it did right an old wrong. 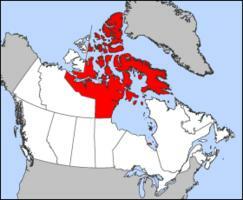 2 The first people to live in Canada's Arctic region were the Tuniit or Dorset people. It is thought that they arrived on the continent from Russia via a land bridge about four to five thousand years ago. 3 Then a new people, the Thule, arrived about 1,000 years ago. For about 500 years they hunted whales and traded with the Vikings for iron tools. No one knows why, but their culture suddenly changed. Instead of hunting whales on the coast, they broke into smaller groups and hunted caribou and seals. 4 It was these people the explorers met, then the traders after them. It was the traders who made the biggest impact on the native people who called themselves Inuit.